Each year, the Anne Pederson Women’s Resource Center at Augsburg College hosts the Koryne Horbal Lecture to bring to campus speakers of national distinction who address issues that influence women. The event attracts Augsburg students, like Smith, as well as faculty and staff members, and—increasingly—members of the greater Twin Cities community. Steinem has traveled the world as a spokesperson for women’s issues, interviewed with national media, led awareness rallies, produced award-winning documentaries, written six books, launched two magazines, and delivered thousands of speeches since the 1970s when she rose to prominence as the Feminist Movement’s most vocal member. Clearly, Steinem is accustomed to standing in the spotlight and at the microphone. And yet, when Steinem stepped on stage in Hoversten Chapel, her initial remarks to the audience members at the April 4 convocation were an expression of modesty. Steinem wished the crowd had gathered with her in a circle where the setting could better reflect equality among all those present, and Steinem acknowledged the other feminist leaders in attendance, among them Koryne Horbal—the event’s namesake. 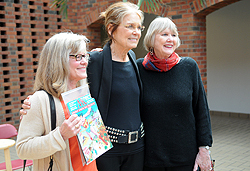 Steinem greets Koryne Horbal Lecture guests including Vicki Bunker, on left. Vicki Bunker, a Twin Cities community member who attended the lecture with a half dozen friends, came to campus for the rare, in-person opportunity to hear Steinem speak and to request that she sign a first-edition copy of Ms. Magazine—the publication Steinem cofounded in 1972 and edited for 15 years. In her talk, Steinem discussed the founding of the women’s movement, the gains that have been made to find equity for all people, and areas in which improvement must still be realized. 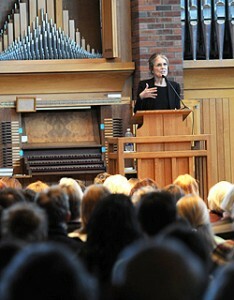 Steinem said some challenges can be addressed through increased awareness among young people and suggested that the liberal arts education at Augsburg plays an important role in establishing equal rights. “On a campus like this, that I know is utterly devoted to social justice, you have all kinds of courses that make a huge, huge difference,” Steinem said. “In general, you have African American studies, Native American studies, women’s studies, gay and lesbian studies,” and more. Steinem said that progress will be made more easily in an environment of support, companionship, and community. Thao-Urabe was recognized at the Koryne Horbal Lecture with a Courageous Woman Award (CWA) for the work she has done internationally and in the Cedar-Riverside neighborhood where Augsburg resides. The CWA was created to recognize women who strive for social justice and peace on campus or in the community and whose efforts, be they small or large, make a difference to women. Augsburg student Kristina Monje ’14 was also recognized with a CWA. Monje is studying creative writing and sociology. She serves as the president of the Mindfulness for Students campus organization, is associate editor of Murphy Square, is a community adviser for Residence Life, is a vital member of the StepUp Program Leadership Team, and was commended for identifying an opportunity to improve students’ Augsburg experience and enhance equality for all those in the College community. Augsburg strives to an inclusive community that welcomes people of diverse backgrounds and experiences. One example includes that in 2009 the Augsburg College Board of Regents approved Reconciling in Christ status, which affirms that the College is welcoming of all people in regard to their gender identity and sexual orientation.